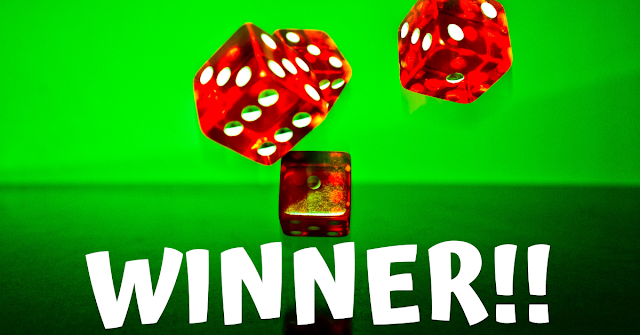 If you have been a reader for awhile now you know how loved Topbox Circle is around here. If you haven't heard of it here is a little about Topbox Circle the free beauty product testing program. 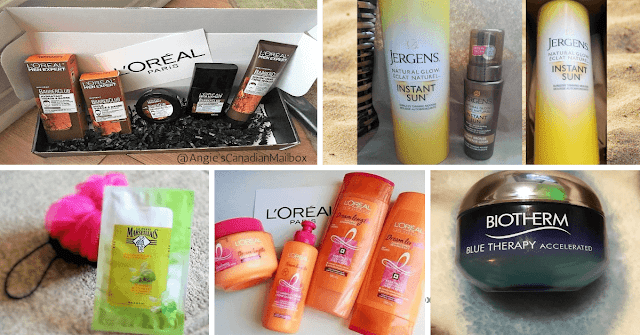 Check out the many products that have arrived in my Canadian mailbox from the Topbox Circle program. I see so many people saddened by not ever getting into a Topbox Circle product testing mission or by only being picked once and then overlooked after that one mission. 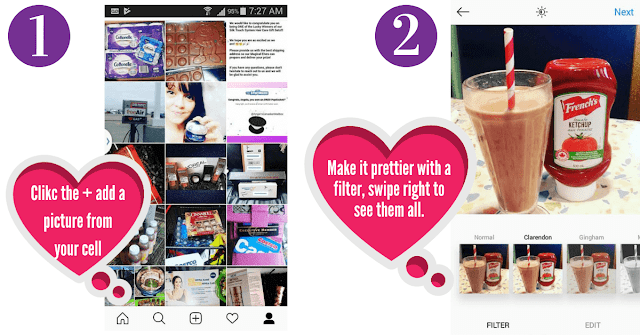 Instagram is an extremely popular way of getting product reviews seen by the people who will be using the products your are posting about it. And to Topbox Circle it is one of the main ways they expect your reviews to be showcased. 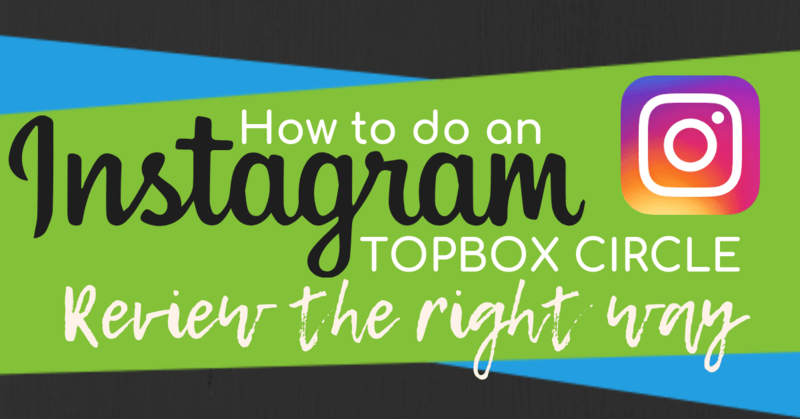 With Instagram being so new to so many people it can be hard to even know where to start with doing your Topbox Circle product review, and I am here to help you out a bit to get you started on the right track. Step Two: Pick the picture from your cell phones gallery that you want to use. Add a filter to enhance your picture to make it the best it can be. 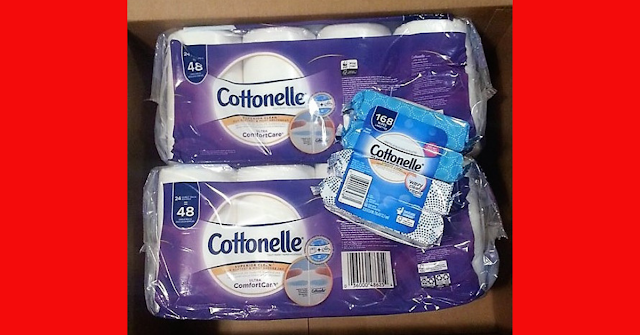 Tip: Make sure when you take a selfie with a product that the brand new of the product is NOT backwards. Neither the brand or Topbox circle will be happy. If you can't achieve that then simply have a friend take a nice picture of you with the product. The point of sharing your review is to showcase the product and if the name is backwards you have defeated the purpose of the review. 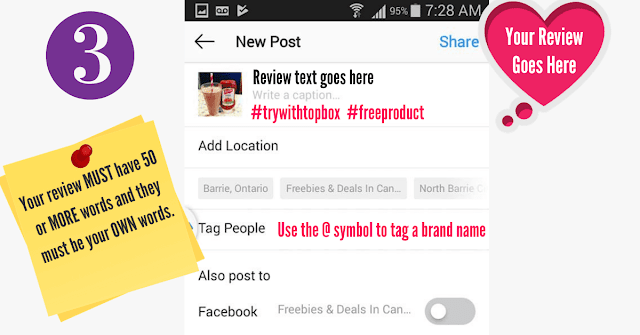 Step 3: Write your review and use all Hashtags and tag the brands that Topbox Circle has requested in your mission. Make sure that your review has 50 words BUT preferably MORE. Use word counter to count your words and check your spelling before posting it. Simply copy and paste your review into Word Counter and it will do the work for you. This way you make sure your review has always met the 50 word minimum limit. 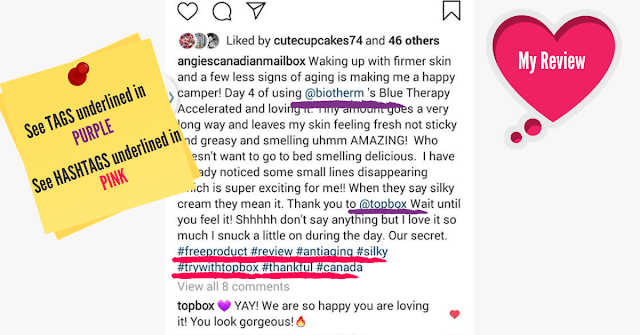 See the example of my Instagram Topbox Circle review below(Notice Topbox commented) Without the proper Hashtags and tags Topbox may not see your review and the brand not seeing it is even worse. Instagram can be a little intimidating if you are new to it, but trust me once you catch the hang of it you will love it! Topbox Circle loves it for sure, so if you want to get picked for product testing missions having your Instagram posts done right is key. READ ALSO: 9 Must have tips for getting Topbox Circle Mission boxes.